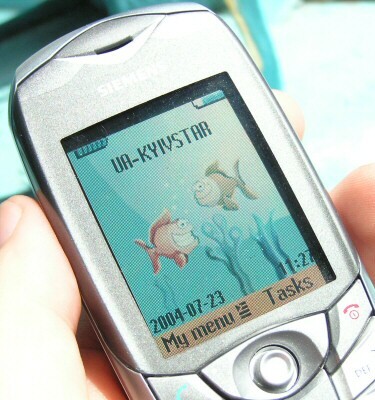 A new series of Siemens phones is, perhaps, one of the most anticipated projects of this year in the mobile industry. The controversial and generally weak 55 series has become out of date and needs a replacement, and as Siemens can boast of a large audience of fans, we can say that there accumulated a large delayed demand for high-quality products with this brand. Indeed, a lot of people still keep their successful but out-of-date phones of the 45 series, the rest use phones of the 55 series, but they are increasingly lagging behind from the market standards by a number of characteristics. The first thing expected from Siemens is the continuation of the brand strategy for functional phones targeted at data management and maximum ease of use of their multiple complex functions. To combine in one product traditional Siemens advantages and a modern implementation level of consumer functions, and to offer the resulting product at a competitive price means to create a new successful Siemens. Let's see how they managed to achieve it in the new series. The first representative of the new generation is Siemens CX65. In the phone series of the german company it should take place somewhere between the popular C65 and business-phone S65. Model positioning is a bit strange for Siemens - it must have become a relatively moderate phone with rich features. Thus, CX65 must satisfy the present demand of consumers, who are exacting to functionality but not ready to pay for business class standards. Those solutions have been repeatedly issued by different manufacturers - remember, for example, Sony Ericsson T300. In fact, CX65 replaces M55 - despite the lettering of the protected handset series, M55 was a simplified model on the S55 platform with rich functions for its class. Such handsets are usually successful in the market, especially in our market, the same applies to the above mentioned two phones - CX65 counterparts. Siemens CX65 is a candy-bar phone with the dimensions slightly above average for our times. Phone dimensions are mostly dictated by a huge display, this is the first element that catches your attention. CX65 has a fresh geometric solution, it somehow resembles M55. Because of the gray color scheme the handset looks business-like, this scheme resolves the contradiction between a frivolous style and serious positioning of the M55. CX65 is made of quality materials, panel near the display and the keys are dark with a glossy surface, which adds gloss to the phone. Silver paint on the other parts also looks good. But the assemblage quality is average, we didn't like noticeable gaps between the front and the side panels. Besides, when you squeeze the phone, it creaks in these places, perhaps the plastic is too thin there. Another brand feature from Siemens - decorative Dynamic Light LEDs in this model are the most successful among the glowing phones. They are hidden in the upper corners of the front panel and they shine through the silver paint layer. Another good feature is that they can be switched off, so those who don't like lighting effects will be pleased - when necessary, the dynamic lights do not give themselves away. But LED lovers will hardly like this element in CX65, because it has only two light dots, which is quite unpretentious. CX65 keypad is tightly packed in the bottom part of the phone - another trait of phones with large displays. The surface of plastic keys in this place almost blends with the body surface. The keys are separated by deep grooves, which let you feel the key borders. In addition to the numeric keypad, the phone is equipped with a five-way joystick, a couple of soft keys, and the call and off buttons - a typical set of controls for Siemens. Numeric keys are generally convenient, but, firstly, the bottom row has to be pressed with a certain effort, plus when you press these buttons, the upper part of the phone outbalances; and secondly, the key form and considerable pressing efforts make the keys inconvenient to press with finger-cushions. The joystick is rather gentle, an easy touch is enough to push it in any direction or press it down, so you have to be careful with it. We didn't like the soft keys either - they are too small, too close to the joystick, so it's difficult to press them. Thus, the keypad in this model is a compromise, its ergonomics has been deteriorated to fit a huge display into the phone body. The phone has no other controls except for the keypad. The only external elements are an IrDA-port on the left edge, camera lens on the back of the phone (not protected but deeply recessed), and a data port on the bottom edge. By the way, the phone is fully compatible with accessories of the 55 and higher series - charger, data cable, and even universal software for data exchange with PC. 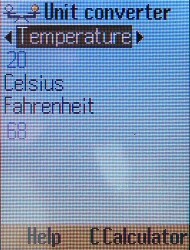 Siemens CX65 possesses a TFT-display with the 132x176 resolution supporting 65 535 colours. The first thing that catches your attention is huge physical dimensions of the display, its area is 13 cm2, which is even used in its advertising. It is most likely the largest display in modern phones, larger displays installed only in smartphones. Another advantage of the CX65 display is that it's transflective: in any situation you can position the phone so that the exterior lighting reflects from the reflective base and highlights the image. This system works at the indoor lighting as well as at daylight, the image is well readable in both conditions, it may just lose some of its saturation. In general, by its usability the CX65 display is one of the best, but if you consider brightness and saturation, Samsung and Motorola displays retain their superiority, but these displays are used only in expensive phones. The drawback of the CX65 display is its higher graininess caused by the combination of the standard resolution and large dimensions of the matrix. The phone is supplied with a 750 mAh Li-Ion battery. In Siemens' traditions the battery has a side binding (two hooks on the left side), but unlike the previous models in CX65 the right side is anchored with a simple latch. Battery binding is extremely easy to use and sufficiently reliable. The battery compartment is closed with a sliding cover, which in our sample was quite loosened because of frequent SIM-card replacements. In new phones it most likely fits rather tight, but still this junction is not designed well enough. 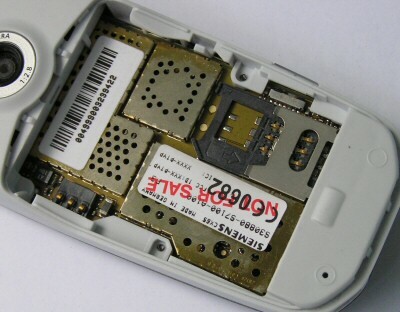 SIM-card slot is also simple with a fixed metal clamp. And the last thing to pay attention to is an untidy look of the battery compartment, you can see a motherboard on the bottom with several parts protected by perforated metal covers. Not a pleasant feel when you replace a SIM-card. We had no doubts that the navigation in CX65 will be maximally close to the standard Siemens scheme, because this company values succession and unification in phones. But there are some cosmetic changes caused by the new five-way joystick used in CX65 instead of the four-way one. In this model you press the joystick to call the menu, and the soft keys are used for fast access to defined applications. As before, a soft key opens a dialog, where you can either run the current program or define another application. In order to run an application, you have to hold down the key. Joystick pushes in standby mode also give access to different applets: down - address book, up - switch profiles, right - incoming messages, left - camera. The menu structure and navigation are traditional. The main menu is a matrix consisting of nine icons, nested menus are unidimensional, textual. All menu items are numbered, quick navigation works with numeric keys, but the display always shows the number of only the current menu item. To confirm dialogs you press down the joystick, to return to the previous level, press the off key (as always in Siemens handsets). The right soft key backs up the joystick and can also be used for confirmations, the left soft key is usually vacant or used for other operations. When appropriate, you can call a context menu, which is usually done by the right soft key. So the system is quite logical. Siemens CX65 is furnished with an excellent advanced address book, which may be familiar to you by the previous business-models from Siemens. 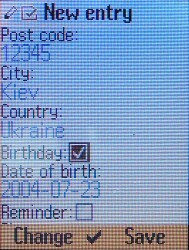 Aside from a large number of phone numbers and e-mails, the traditional benefits include two fields for contact names (name and surname); full compatibility with MS Outlook, which allows to synchronise contacts with this program; detailed address view; birthday field automatically synchronised with the organiser and allowing reminders. 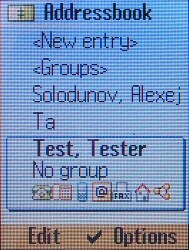 Innovations include a field for ICQ UIN, AIM and WV nicks, an option to collapse selected field groups into titles to make the address book more compact and convenient to view, and a new contact list view: now a selected record contains a group mark and icons of the filled in fields. Extra features of the address book - eight preset groups of contacts (groups can be renamed but they cannot be added or removed), photos displayed at incoming calls. Voice dial is not implemented in this model. 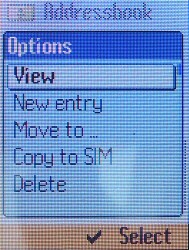 Records from the phone memory and the SIM-card can be displayed only separately by the "joystick-down" and from the main menu. To switch to the other memory type, you have to execute a special command in the address book menu - select Default book. 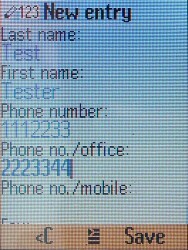 This is a standard solution for Siemens, as is the case with all other phones with advanced address books. The Call Records menu contains standard tools for registering calls of all types, their length, and cost. 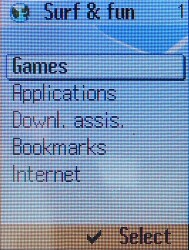 The standard Siemens Surf & Fun menu comprises a WAP-browser and access to games and applications. WAP-browser supports WAP 2.0 and HTTP protocols, that is, it allows to get access to common Web-services as well. WAP configuration, though spread in two places (browser options and Connectivity item in the Setup menu), does not cause any problems as it uses a standard set of parameters and their titles. Working in Internet is more convenient because of the large display size. 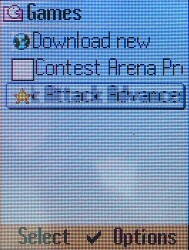 All games, preinstalled in the phone, are written in Java. In our case it was a new version of the all-Siemens logic arcade Stack Attack - this time a 3D version, interesting and playable enough. You can always delete midlets and install new ones - a convenient Download Assistant is used for these purposes. The structure of the uploaded software is simple: game midlets are installed to the Games folder, work applications - to the Applications folder. 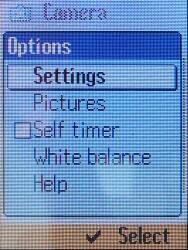 The Camera menu gives access to the photo and video shooting options. 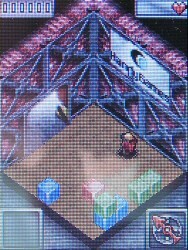 Note that CX65 contains an embedded CMOS VGA camera (640x480 maximum). In camera mode the display serves as a viewfinder, to take a picture or start a video recording you should press the joystick. Push the joystick in horizontal directions to adjust the exposure, with vertical pushes you control the digital 5x zoom. There are few camera options: you can only control the image resolution quality (three options, regardless of the preview image resolution), white balance selection mode (automatic, indoor, outdoor), and a self timer. The left soft key switches to the video mode, in this case the phone records movie clips up to 15 seconds with sound by default but you can switch the microphone off. Image quality is rather good, even uncharacteristic of CMOS VGA-cameras. 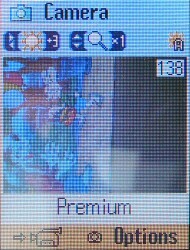 The camera features an uncommonly low noise level at underlighting, but sometimes it still blurs images due to high exposure indoors. As for the rest, images are not bad - they are well saturated, clear, and have correct color rendering. Video is recorded with a stable high frame rate, but, of course, the quality is worse. 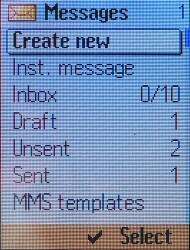 The Messages menu item contains everything you need to manage messages. CX65 supports SMS, MMS and e-mail. 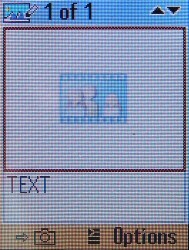 In the applet window they all have the same folders for incoming, outgoing, sent messages. Inside these folders messages are separated by their type. 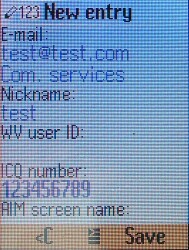 From this menu you can also access the WV instant messaging service, which requires operator's support. 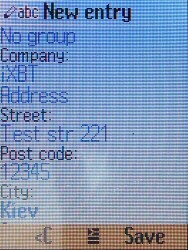 Note that Siemens CX65 is the first reviewed phone with such a tight instant messaging integration (preinstalled client with a standard access for a message applet, plus fields to store UINs in the address book). 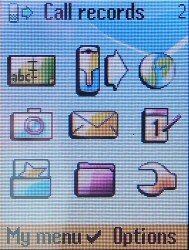 This menu also contains settings for all messaging services including e-mail. 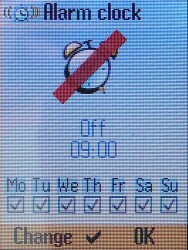 The Organiser menu contains a calendar with appointments and accompanying utilities - meeting lists and notifications, notes for brief text memos, world time clock, dictating mac, and separately - a list of missed appointments. 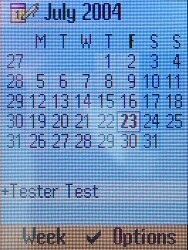 The calendar has three views - monthly, weekly, and daily. 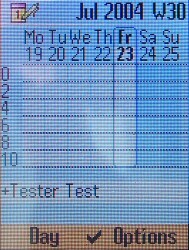 In the first case, days with entries for appointments are highlighted, and when you select a day, the status line shows titles of the scheduled events. When you schedule an appointment you can select its category (memo, call, meeting, voice memo, birthday, holiday). 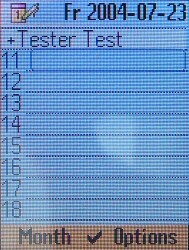 Different input/selection fields are displayed depending on the appointment type. Memory for organiser records is dynamically allocated, you can input over 1000 appointments. Thus, this Siemens tool is probably the most flexible and powerful among all phones (except for smartphones). If you wish, you can browse the list of all appointments in a special applet in this menu. Task list also possesses advanced tools for time planning, it allows to select a task type, priority (5 degrees) and other typical parameters. A list of tasks can be imported from the server via SyncML right in this applet. CX65 dictating mac allows to record fragments of arbitrary length limited only by the free memory volume. 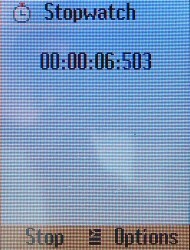 Unfortunately, the dictating mac does not work during calls. The Extras menu contains additional utilities. As is it always the case with Siemens, this menu contains an alarm clock, calculator, unit converter, stopwatch, countdown, remote synchronisation via SyncML, access to a file browser, and - I don't know why - another dictating mac menu item. These utilities have migrated to CX65 from previous models almost without modifications. 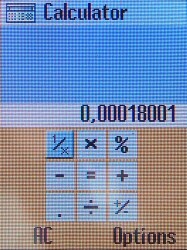 The alarm clock lets you schedule recurrent alarms for selected days of the week, the calculator can do basic calculation tasks, plus it can convert to percents and do reversions, the unit converter can convert measurement units of length, temperature, energy, velocity, mass, area, volume, power, time, pressure, and currencies. The other utilities do not need an introduction. 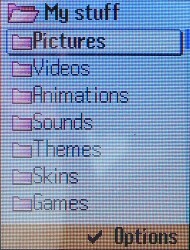 The My Stuff menu is a file manager typical for Siemens. CX65 file system, as in other Siemens phones, has a developed structure and allows most file operations familiar to PC users, in particular - to receive/send via IrDA and store in memory data in different formats. Here you can view images and video clips, playback sounds stored in the corresponding folders. And the last menu (Setup) gives access to different phone settings. Again, as in all Siemens phones, it comprises absolutely all settings (except for messaging service settings) - profiles, ringtones, WAP, GPRS, network, security, etc. The structure and labels of menu items are quite logical and clear, so it should not cause any problems. The only function, which is not comprehensible enough for novices, is call transfer, it is not so convenient to use it frequently. Let's mention another feature of the CX65 profile settings, which first appeared in Siemens phones - profiles do not include ringtone settings, the ringtones are assigned to the groups and to the address book. This eliminates mishmash when you change profiles, but it does not allow different ringtones for different environments, which is sometimes useful for polyphonic sounds. CX65 has 11 MB of installed memory dynamically allocated to all applications. This is not a record breaking value, but still it's good, it allows users to indulge in Java-applets, storing important MMS-messages, photos and video clips, lengthy voice records. You can also transfer small files from one PC to another in your phone, by uploading them via IrDA or a data-cable. The connection quality in Siemens CX65 is typical to a modern city handset, within the tight GSM coverage the reception is steady. 40-chord polyphonic ringtones sound very good, but the main format for storing melodies - MIDI - was not supported absolutely correctly in our current flash version. Uploaded midi files without special editing sounded very quiet. It is a software bug, because the speaker is load enough - preinstalled ringtones and recorded sounds are played back rather loudly. The vibra alert in CX65 is powerful enough, it possesses a large amplitude at medium frequency, so you can feel it well. In total, Siemens CX65 came up to our expectations. It's a functional phone outfitted as a traditional Siemens business-model (except for Bluetooth) with some extra features extending its usage. We want to particularly mention the excellent, a tad improved in comparison with the 55 series, address book, powerful organiser, advanced tools for transferring and storing data, dictating mac allowing to record lengthy voice memos. Richness of functions and ease of use (except for the base settings, but you don't have to change them very often) are combined in CX65 with the excellently implemented new features - high-quality large display with a reflective base (and thus readable in daylight), good VGA camera capable of recording video. There are some drawbacks, of course. The most critical ones are the keypad ergonomics, the unfinished MIDI-synthesizer, and too many settings in the Setup menu. Fortunately, we can expect that the second problem will be resolved in the next flash versions. Subjectively, we liked the phone a lot for its rich functions and a huge display. For now Siemens CX65 costs $270-290, it's a rush price usual for the first lots. In our opinion, the optimal price for this model is $200-220. In its class CX65 has no competitors with the same functions, it enters the market earlier than its counterparts from Alcatel and Sony Ericsson, and so it can evidently count on success.